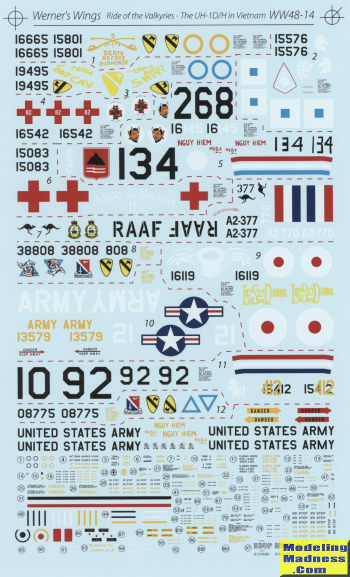 The recent release of the Kitty Hawk 1/48 UH-1D/H has prompted the release of this decal sheet and Huey fans are very happy to see it. 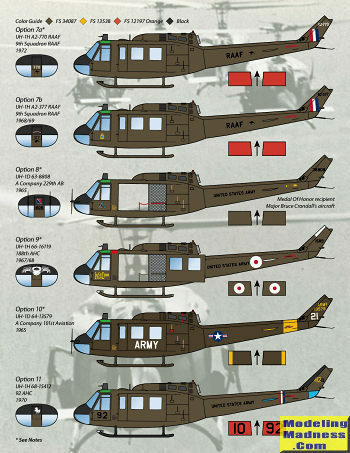 While I am sure this set was designed for the KH kit, the truth is that it will fit any 1/48 UH-1D/H kit as none of the markings are such that they must have a certain kit for fit. All but one of the dozen markings options are for overall olive drab aircraft, though the shade of this OD will not be the same for every option, thanks to the rapid fading of this color. Also note that there is one option not shown in the above image. Two of these are for the RAAF. These two aircraft differ only by serial number as apparently personal markings were not allowed. I should also mention that every set of markings is taken from period photos of these planes. The instructions provide notes on each aircraft to alert you to any oddities unique to that aircraft. You may notice that some of the very thin 'jump doors' on several options have no window. That is because, according to the notes, Bell stopped adding those during H production as they were easily damaged and not considered very useful. The sheet includes both D and H variants with dates ranging from 1965 to 1972. I recommend visiting their web site for a few more details on each plane. I was somewhat surprised not to see a lot of nose art on this sheet, though there is some. Perhaps that is being held back for a future release. One gets a full set of stencils and a comprehensive stencil placement guide. 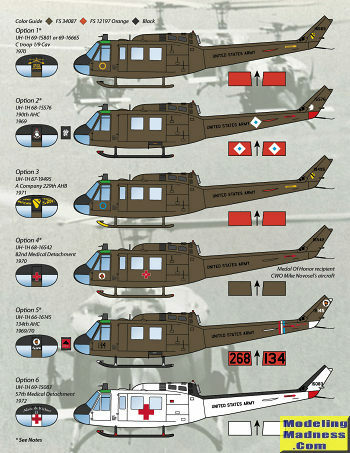 This is an excellent sheet for those wanting to model this helo. Review copy courtesy of www.wernerswings.com. Get yours direct at this link.